Although Pak Chong in and of itself is not of much interest to most Western travelers, it is conveniently located on Thailand’s Northeastern Railway Line and is the gateway to Khao Yai National Park. Spend 36 Thai Baht, around $1, for a ticket on the number 71 “Express” train from Bangkok and you will arrive there in less than four hours. 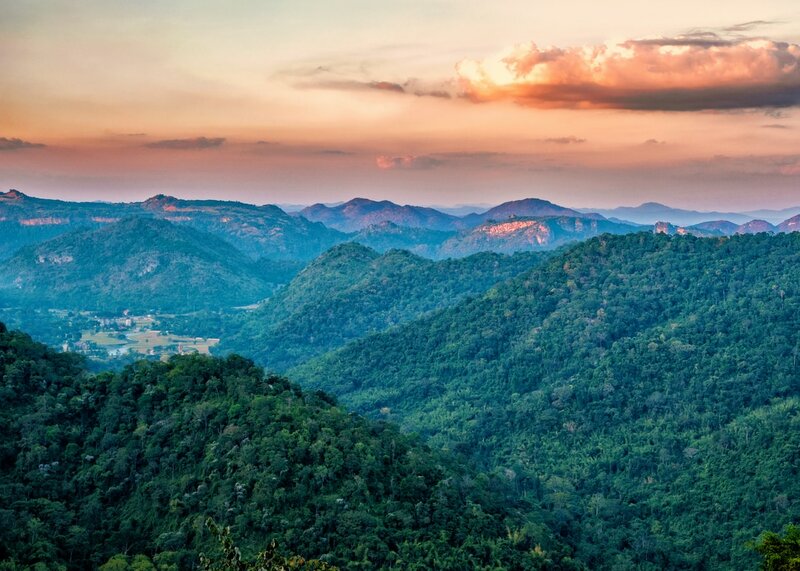 Established in 1962, Kho Yai is Thailand’s first national park, it’s third largest, and is included in the UNESCO World Heritage Site known as the Dong Phayayen-Khao Yai Forest Complex. 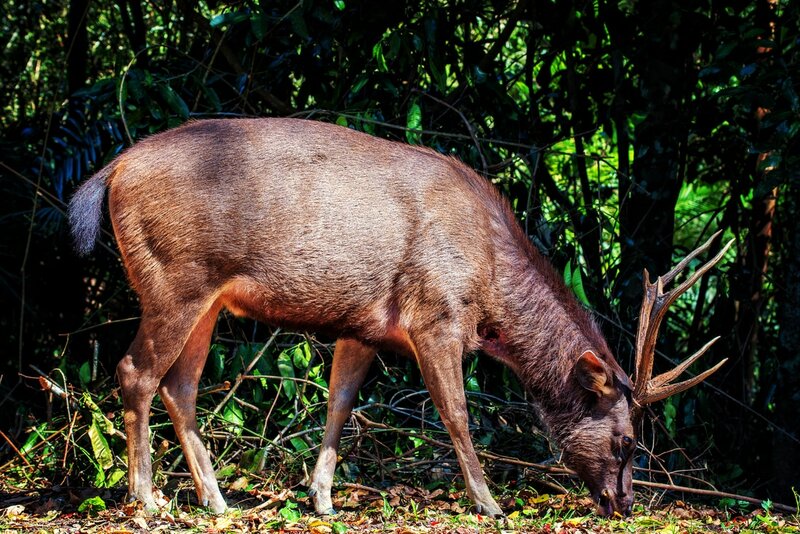 Covering an area of 837 square miles (2168 km²), most of which lies in Nakhon Ratchasima Province, the park is comprised of several different types of forest such as dry evergreen, tropical moist evergreen, dry deciduous and grassland areas. The park is home to over 300 species of birds, 74 species of reptiles and amphibians and 60 species of mammals including elephants, deer, macaques, gibbons and black bears. 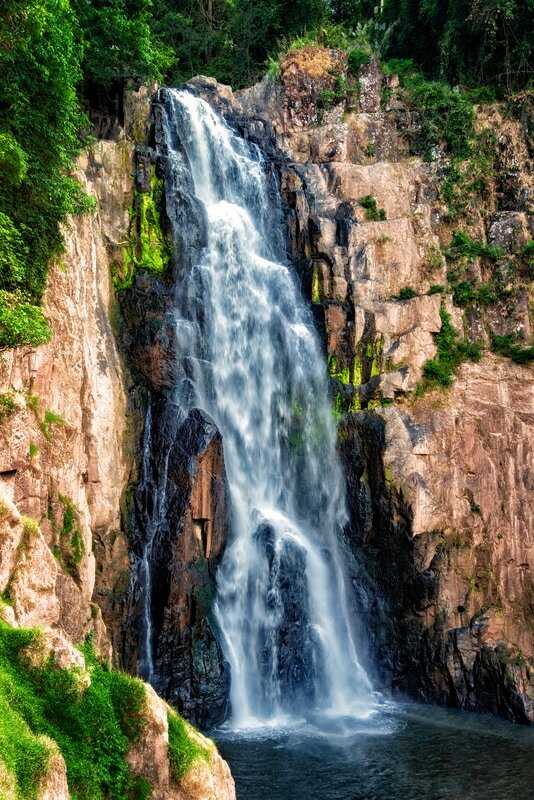 The park features six stunning waterfalls, five marked hiking trails, a wildlife viewing tower and numerous scenic viewpoints. The park’s main entrance, also called the northern entrance, is 17 miles (28 km) south of Pak Chong on Highway 2090. It can be reached very inexpensively (40 Thai Baht) by catching a songthaew from downtown Pak Chong. These particular songthaews, painted blue, travel up and down Highway 2090 throughout the day until approximately 6:30 PM. It should be noted that there is no public transportation in the park itself. Within the park boundaries hitchhiking is very common and considered to be relatively safe although traveling the park’s winding roads in the bed of a pickup truck obviously entails a certain degree of risk. A far better option for touring the park is to rent a car or motorcycle both of which are available in Pak Chong. Accommodations within the park are limited to camping. Tent rental is widely available, as are bungalows operated by the park service. It should be noted that the bungalows must be reserved well ahead of time and are generally fully booked. The park becomes very busy on weekends and holidays as it is an extremely popular destination for the Thai people. We suggest visiting the park on weekdays when there are fewer people in the park and area hotels are largely vacant. Another option is to stay at one of the many hotels, “resorts” and guest houses that line Highway 2090. Many, if not most, of these establishments cater to the locals with Thai language websites and no possibility of booking on-line with Booking.com, Agoda, etc. However, finding accommodations is generally easy on most weekdays by simply walking into these places. Many foreign visitors choose to book an organized tour with local companies such as Greenleaf Guesthouse and Tours. Greenleaf will pick up guests at either the railway or bus station in Pak Chong and drive them the 7.5 miles (12 km) south to their guest house on Highway 2090. Using the guest house as a base, travelers will spend half a day visiting popular sites located outside of the park, and then spend the following day touring the park itself. Return transportation to Pak Chong is also provided free of charge. Pak Chong can be reached very inexpensively by either bus or train. From Bangkok buses and mini-buses (vans) depart from the northern bus terminal known as Mo Chit; the trip takes approximately three hours and costs 145 Thai Baht. Ten trains depart daily for Pak Chong from Bangkok’s Hua Lamphong Railway Station. Travel time and fare varies depending on which train number and seat class is chosen. Third-class tickets can be purchased for 28 Thai Baht (80 cents). Many travelers will visit Ayuttaya either before or after seeing Pak Chong. We recommend making this journey by train as the travel time is only two to three hours and the fare is very inexpensive. Third-class tickets can be purchased for 23 Thai Baht or 65 cents. It is advisable to consult the timetable and fares page of the State Railway of Thailand website before arriving at the station.